Though there are fertile fields on the coast near the capital city of Sentinel, it is the arid expanses of the interior that have captured the hearts of the rugged Redguards. The Alik'r is rich in mineral resources, but its fierce creatures and harsh terrain are daunting to most. 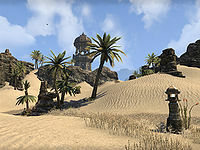 The Alik'r Desert is a region along the northern coast of Hammerfell. Inland it is an arid wasteland, and beneath the sands lie ancient ruins ripe for plunder; but there are also many dangerous creatures waiting to pounce on the unwary adventurer. Despite the harsh conditions there are some successful settlements in the area, notably Sentinel and Bergama. Life in the desert is tough, but there are many nomadic tribes who live in and with the Alik'r, moving with the desert onto their next meal. These tribes are well-versed in the hiding places of the creatures of the desert, and have ingenious contraptions for collecting water (such as the simply named "desert water catcher" used for catching the morning dew). When preparing to travel the Alik'r you are well advised to fully cover the body, to protect from sunburn and the occasional sandstorm. Locally treated and designed leather armor is advised as it has been honed to suit the conditions of the desert. It covers the whole body, with cloth patches to allow the skin to breathe, and also provides protection against the creatures of the desert. Myrkwasa is the western region of the Alik'r, stretching from Sentinel in the north to the seasonal Ash'abah camp of Morwha's Bounty in the south. To the east, the desert dunes roll past the Goat's Head Oasis and the ancient Yokudan ruin of Tu'whacca's Throne into the expansive central region of the Hollow Wastes. 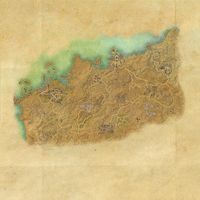 The region is the site of the ancient Redguard training grounds at Leki's Blade, as well as the Aswala Stables, breeders of the famous Yokudan Charger. The port city of Tava's Blessing on the north coast is the site of the Redguard naval shipyards. In the east, the Rocky outcrops of Tigonus dot the landscape between the cities of Kozanset and Satakalaam, and the historic Yokudan site at HoonDing's Watch. Local authorities are investigating reports of the Withered Hand necromancer cult and the Imperial Seventh Legion being sighted in the region. Ash'abah Pass — A fortified coastal pass in the Alik'r Desert visited only during the Daggerfall Covenant quest The Initiation. Badwater Mine — A mine located near the southern wall of the city of Sentinel. Impervious Vault — A fortified storehouse buried underneath a tower in the city of Sentinel. Shore Cave — A small cave in the cliffs on the beach of Sentinel. Risen From the Depths: Save the Sentinel guards from their honor-bound handicap. Rise of the Dead: Investigate reports of the Withered Hand for King Fahara'jad. The Impervious Vault: Stop the Withered Hand from raiding the Impervious Vault. In Search of the Ash'abah: Look for the Ash'abah in the deserts of Myrkwasa. Morwha's Curse: Help the Ash'abah concoct a poison antidote. The Initiation: Join the Ash'abah tribe. Ash'abah Rising: Meet the Ash'abah at Tu'whacca's Throne. Tu'whacca's Breath: Help the Throne Keeper cleanse Tu'whacca's temple. A Reckoning with Uwafa: Destroy the defiler of Tu'whacca's sacred grounds. The Scholar of Bergama: Seek out a scholar who knows about the Ansei Wards. Gone Missing: Investigate the disappearances in Bergama. Trouble at Tava's Blessing: Cross the Hollow Wastes and find the Prince. Alasan's Plot: Stop a powerful necromancer from becoming a lich. Shiri's Research: Follow an apprentice's research across the sands of Tigonus. March of the Ra Gada: Follow the trials of the coming of the Ra Gada to Tamriel. Trials of the Hero: Learn from the spirits of heroes at HoonDing's Watch. The Search for Shiri: Look for the missing apprentice in Satakalaam. Imperial Incursion: Rescue hostages from the Imperials in Satakalaam. Amputating the Hand: End the threat of the Withered Hand in Alik'r. Restoring the Ansei Wards: Restore the Ansei's protection to the consecrated dead of the desert. Kingdom in Mourning: Make haste for Bangkorai and rally the defenses of Evermore. A Blessing for the Dead: Bring a Thronekeeper back to Tava's Blessing to help consecrate the dead. Tracking the Hand: Search for the Withered Hand at Tava's Blessing. Badwater Mine: Rescue a miner's partner from a collapsing mine. Lady Laurent's Favor: Help the Lady's butler recover her tools. Monkey Magic: Help a monkey to reverse the effects of a potion. The Nature of Fate: Help an old Redguard test the winds of fate. The Oldest Orc: Break the curse of an Orc imprisoned for ages. Past in Ruins: Help find an ancient Yokudan sword. Revered Ancestors: Ensure the honored dead remain in the ground. Satak was the First Serpent: Try to understand a wanderer's views on creation and rebirth. The Search is Over: Bring word to a traveler's wife that he will be home soon. Seize the Moment: Help a Baandari trader recover her wares. Trouble at the Rain Catchers: Help cleanse the contaminated Sentinel water supply. Left at the Altar: Try to save a Crown and Forebear marriage. Master of Leki's Blade: Investigate the shadow hanging over Leki's Blade. Past Due: Chase up an outstanding debt in Kozanset. Snakes in the Sands: Save the caravan that was attacked by snakes. Trapped in the Bluffs: Rescue the family that became trapped by snakes. Undying Loyalty: Help a dog find buried bones. Warship Designs: Recover important military plans from the naval shipyards. Whose Wedding? : Help the matchmaker at Sep's Spine. A Winner for Onwyn: Help save the lizard racing track. Honoring the Dishonored: Consecrate the remains of a Redguard's wife. An Ill-Fated Venture: Recover Yokudan relics from an ancient tomb. Malignant Militia: Discover why the militia are doing nothing about the bandits. The Nature of Fate: Part Two: Help a Redguard spurn the grip of fate. The Real Snake: Confront a shady character with proof of his misdeeds. Secrets of the Lost City: Help a Redguard historian gain access to lost knowledge of his ancestors. Temple's Treasures: Recover the missing relics for the High Temple. 5 items: When an enemy within 28 meters of you dies, heal for 15-1290 Health and gain 15-1290 Magicka. This effect can occur once every 3 seconds. 5 items: Adds 5-450 Weapon Damage to your Two Handed abilities. 5 items: Gain Minor Vitality at all times, increasing your healing received by 8%. This page was last modified on 12 June 2018, at 03:43.